Retail sales taxes are one of the more transparent ways to collect tax revenue. While graduated income tax rates and brackets are complex and confusing to many taxpayers, sales taxes are easier to understand; consumers can reach into their pockets and see the rate printed on receipts. In addition to state-level sales taxes, consumers face local-level sales taxes in 38 states as well. These rates can be substantial, so a state with a moderate statewide sales tax rate could actually have a very high combined state-local rate compared to other states. This report provides a population-weighted average of local sales taxes in an attempt to give a sense of the statutory local rate for each state. See Table 1 at the end of this Fiscal Fact for the full state-by-state listing of state and local sales tax rates. 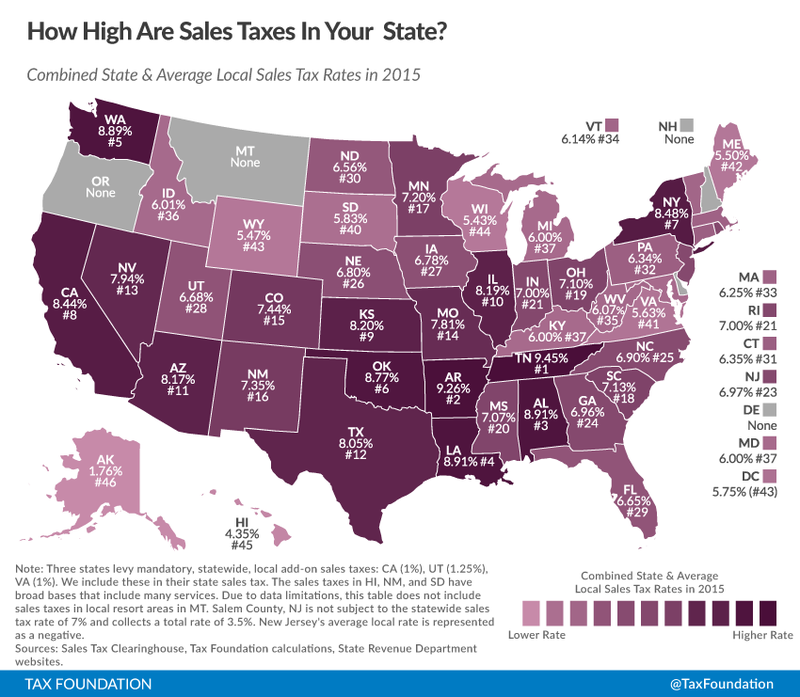 Five states do not have statewide sales taxes: Alaska, Delaware, Montana, New Hampshire, and Oregon. Of these, Alaska and Montana allow localities to charge sales taxes. No changes to state-level sales taxes took effect in the first half of 2014. However, Rhode Island considered eliminating its 7 percent sales tax in 2013 and revisited the idea in January of 2014.Had the proposal passed, Rhode Island would have become the first state ever to repeal its statewide sales tax. On October 1, 2013, the District of Columbia lowered its sales tax from 6 percent to 5.75 percent. In May of 2014, the D.C. Tax Revision Commission suggested raising this rate back up to 6 percent as a part of its comprehensive set of recommendations to the D.C. Council, which also included rate cuts in other parts of the tax code. The Council decided against the sales tax rate increase, however, keeping Washington, D.C.’s sales tax rate below the rates in neighboring Northern Virginia and Maryland and instead broadening the sales tax base slightly. This base expansion partially offset decreases in individual and corporate income tax rates. The five states with the highest average local sales tax rates are Alabama (4.91 percent), Louisiana (4.91 percent), Colorado (4.54 percent), New York (4.48 percent), and Oklahoma (4.27 percent). At the beginning of 2014, Mississippi had the lowest non-zero average local sales tax rate at 0.004 percent, attributable to the state’s only local sales tax at the time: a 0.25 percent sales tax in the city of Tupelo. In a referendum on the local January 2014 ballot, residents of Jackson approved a 1 percent city-wide “special sales tax.” The new tax took effect in the state capital on March 1, 2014, raising Mississippi’s average local rate to 0.07 percent. Idaho now has the lowest non-zero average local rate with 0.01 percent. Only a handful of cities and counties levy a local sales tax on top of the statewide rate of 6 percent. Avoidance of sales tax is most likely to occur in areas where there is a significant difference between two jurisdictions’ sales tax rates. Research indicates that consumers can and do leave high-tax areas to make major purchases in low-tax areas, such as from cities to suburbs. For example, evidence suggests that Chicago-area consumers make major purchases in surrounding suburbs or online to avoid Chicago’s 9.25 percent sales tax rate. At the statewide level, businesses sometimes locate just outside the borders of high sales tax areas to avoid being subjected to their rates. A stark example of this occurs in the Northeast, where even though I-91 runs up the Vermont side of the Connecticut River, many more retail establishments choose to locate on the New Hampshire side to avoid sales taxes. One study shows that per capita sales in border counties in sales tax-free New Hampshire have tripled since the late 1950s, while per capita sales in border counties in Vermont have remained stagnant. This report ranks states based on tax rates and does not account for differences in tax bases (e.g., the structure of sales taxes, defining what is taxable and non-taxable). States can vary greatly in this regard. For instance, most states exempt groceries from the sales tax, others tax groceries at a limited rate, and still others tax groceries at the same rate as all other products.Some states exempt clothing or tax it at a reduced rate. It is worth noting that population numbers are only published at the ZIP code level every ten years by the Census Bureau, and editions of this calculation published before July 1, 2011 do not utilize ZIP data so are not strictly comparable. Sales taxes are just one part of an overall tax structure and should be considered in context. For example, Washington state has high sales taxes but no income tax; Oregon has no sales tax but high income taxes. While many factors influence business location and investment decisions, sales taxes are something within policymakers’ control that can have immediate impacts. Joseph Henchman, Testimony before the Rhode Island Special Joint Legislative Commission to Study the Sales Tax Repeal, Nov. 21, 2013, http://taxfoundation.org/article/testimony-rhode-island-special-joint-legislative-commission-study-sales-tax-repeal. Scott Drenkard & Joseph Henchman, D.C. Now Better than Virginia and Maryland on Sales Tax Rates, Tax Foundation Tax Policy Blog, Oct. 2, 2013, http://taxfoundation.org/blog/dc-now-better-virginia-and-maryland-sales-tax-rates. DC Tax Revision Commission, Recommendations: Final Report 2014,http://media.wix.com/ugd/ddda66_b54af5563fa54a17af9b41fc06aa672f.pdf. Joseph Henchman, D.C. Council to Vote on Tax Reform Package Today, Tax Foundation Tax Policy Blog, June 24, 2014, http://taxfoundation.org/blog/dc-council-vote-tax-reform-package-today. Jason Hancock, Missouri transportation sales tax defeated, Kansas City Star, Aug. 5, 2014,http://www.kansascity.com/news/government-politics/article1101536.html. Brian Eason, 9 in 10 Jackson, Miss., voters approve 1% sales tax, USA Today, Jan. 15, 2014,http://www.usatoday.com/story/news/politics/2014/01/15/jackson-ms-sales-tax-vote/4489851/. Scott Drenkard, Results of 2014 State and Local Tax Ballot Initiatives, Tax Foundation Tax Policy Blog, Nov. 5, 2014, http://taxfoundation.org/blog/results-2014-state-and-local-tax-ballot-initiatives; Kelsey Ryan, City Council votes to place proposed sales tax on November ballot, Wichita Eagle, Aug. 5, 2014, http://www.kansas.com/2014/08/05/3582950/city-council-votes-to-place-proposed.html. Mehmet Serkan Tosun & Mark Skidmore, Cross-Border Shopping and the Sales Tax: A Reexamination of Food Purchases in West Virginia (Working Paper, 2005),http://www.rri.wvu.edu/pdffiles/Tosunwp2005-7.pdf. See also Randolph T. Beard, Paula A. Gant, & Richard P. Saba, Border-Crossing Sales, Tax Avoidance, and State Tax Policies: An Application to Alcohol, Southern Economic Journal, 64(1), 293-306 (1997). Susan Chandler, The Sales Tax Sidestep, Chicago Tribune, July 20, 2008,http://articles.chicagotribune.com/2008-07-20/business/0807190001_1_sales-tax-tax-avoidance-tax-landscape. Art Woolf, The Unintended Consequences of Public Policy Choices: The Connecticut River Valley Economy as a Case Study, Northern Economic Consulting, November 2010,http://vtdigger.org/vtdNewsMachine/wp-content/uploads/2011/02/20101101_woolfArtUnintended.pdf. For a list, see Tax Foundation, 2014 State Business Tax Climate Index, Tax Foundation Background Paper No. 68 (Oct. 9, 2013), http://taxfoundation.org/article/2014-state-business-tax-climate-index. Liz Malm & Richard Borean, How Does Your State Sales Tax See That Blue and Black (or White and Gold) Dress?, Tax Foundation Tax Policy Blog, Feb. 27, 2015,http://taxfoundation.org/blog/how-does-your-state-sales-tax-see-blue-and-black-or-white-and-gold-dress. Justin M. Ross, A Primer on State and Local Tax Policy: Trade-Offs Among Tax Instruments,Mercatus Center at George Mason University, (Feb. 25, 2014).http://mercatus.org/publication/primer-state-and-local-tax-policy-trade-offs-among-tax-instruments. For a representative list, see Scott Drenkard & Joseph Henchman, 2015 State Business Tax Climate Index, Tax Foundation (Oct. 28, 2014), http://taxfoundation.org/article/2014-state-business-tax-climate-index. Joseph Henchman, Vida Fitness Spreads Half-Truths about DC Tax Cut Bill, Tax Foundation Tax Policy Blog, May 30, 2014, http://taxfoundation.org/blog/vida-fitness-spreads-half-truths-about-dc-tax-cut-bill. Nicole Kaeding, The D.C. ‘Fitness Tax’ in Context, CATO AT LIBERTY, Jun. 13, 2014,http://www.cato.org/blog/dc-fitness-tax-context.